If you want to use your computer to make a book or a magazine, the final step before printing is called imposition. 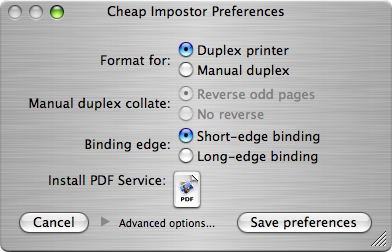 Cheap Impostor is a simple yet powerful alternative to fancy imposition software. It doesn't offer all the features of high-end imposition software (which costs hundreds or thousands of dollars). Hence the name. However, if you want to print and bind booklets, magazines, or even long books, this program might be all the imposition software you need. Without imposition software the simplest way to transform your document into a magazine would be to use a photo-copier to shrink the pages so two fit sideways on a sheet of paper, and reorder them so that when a stack of them is stapled and folded in half the pages appear in the correct order. The short story is that Cheap Impostor lets you skip the photocopier step, and produce output from your printer that can directly be turned into a magazine. Further, Cheap Impostor has settings that let you create books with multiple signatures. Tutorial: Binding books with Cheap Impostor This is a description of how I used Cheap Impostor to print and bind a book. Blog posting: Rick DeNatale posted a very nice blog post about using Cheap Impostor to make books. I like his press more than mine - I think I'll be building one like it. Comes with an easy to read How-to Guide that explains what "sheets per signature" means, and how to use Cheap Impostor to make books and magazines. Cheap Impostor is shareware, and a bargain at $35 (if I do say so myself). After purchasing you will receive a registration code that will unlock very useful features. This license covers all future versions of Cheap Impostor. If you don't receive your registration code promptly, please send me an email. This is a mecodegoodsomeday production. A K M Adam says "...Cheap Impostor, my favorite among page-imposition programs, has at last released a version that resolves the two-up PDF problem for printed matter that doesn’t need imposition..." Thanks AKMAdam! You're welcome! The inspiration to write Cheap Impostor was when I bought a Minolta 2350 Color Laser, and had exactly the same challenge. Thanks! I think the readme is kinda funny too. Searching for MacOS X software for "PDF booklet", yields two similar products: Cocoa Booklet and Book Lightning. Both of these programs make magazines from PDF files. Cocoa Booklet's price certainly is right: it's free! It's also quite slow: I tried to impose the Subversion manual using Cocoa Booklet, but the program failed after 5 minutes with no visible change on the progress bar. On the same machine (500 MHz G4) Cheap Impostor finishes this file in 30 seconds. Book Lightning is also $35. 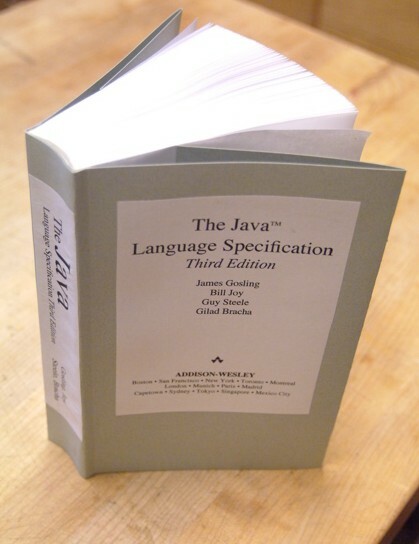 It is also very fast - it processed the Subversion book in 5 seconds. 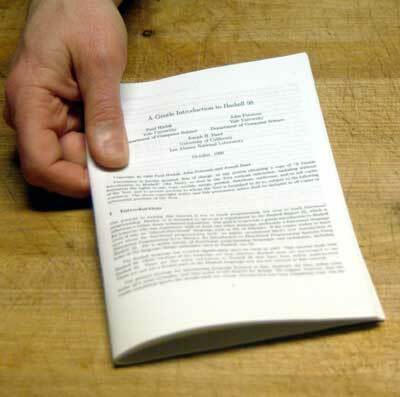 However, even though it can impose a 250 page document in 5 seconds, unless you have a better stapler than I do, there's not much you can do with its output. Cheap Impostor, at $35, lets you print the book with multiple signatures which you separately fold and glue to turn into a bound book. 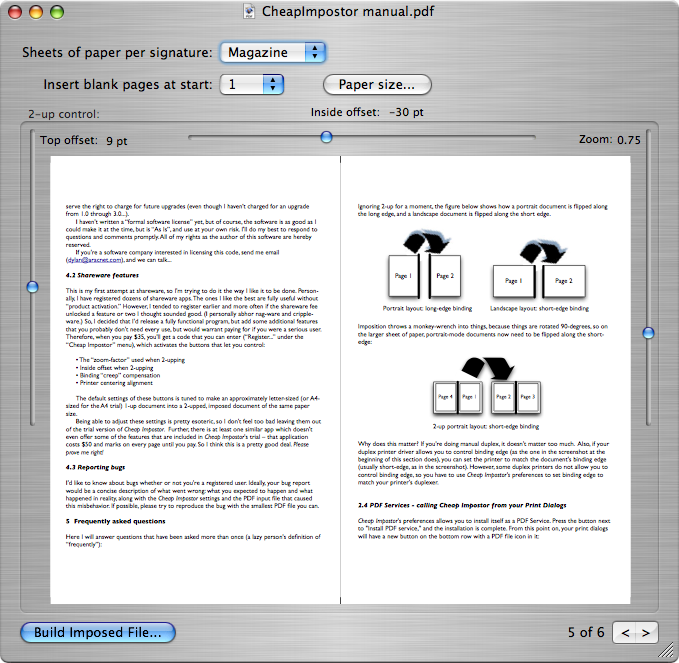 For shorter documents, Cheap Impostor lets you make stapled magazines like the other programs. 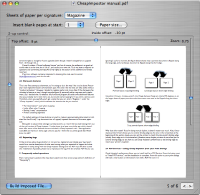 Finally, unlike either of these programs, Cheap Impostor gives you control over page zoom and offset that lets you successfully make books out of awkward or poorly formatted PDF files. So there you have it, a biased review of low-cost imposition software for MacOS X! Hey, waitaminit -- here's an unbiased review of the same three programs, and in my humble opinion, they agree with me! But it was written before Cheap Impostor added "creep". MacOS X 10.5 - 10.14 for version 3.3. MacOS X 10.4 for Version 3.1. MacOS X 10.3.9 or greater for version 2.